*Copies of any of the Parent's Pedigrees, OFA, DNA & DM Info. 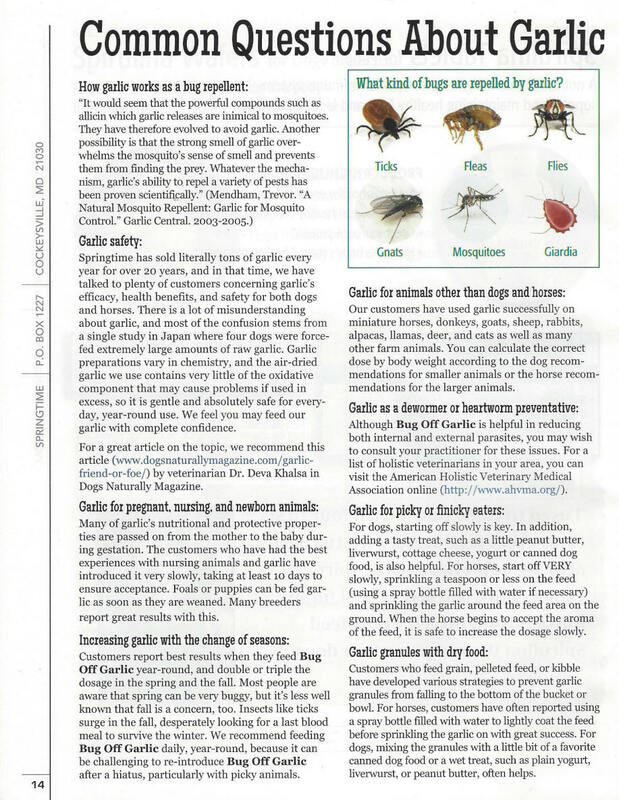 *Springtime Inc.'s Catalog-We use their Garlic for our dogs! *We go over The Whole Dog Journal's Top Approved List Of Dry Dog Foods! including a copy of your puppy's test for your records. If you recently got one of our puppies or have one of our older pups, and live close by please visit Dori and she will help you with all your pet's needs! All puppies will forever be a part of us and we will always be available for phones calls, visits and emails! We take pride in knowing that you have US for the LIFE of your new baby! I personally take great pride in knowing each and every one of my puppies before they leave here. Each Puppy has a folder that I keep with his or her information and any pictures, emails, letters and accomplishments from you. Puppies usually can go home with their new owner somewhere between 7 and 10 weeks of age. This also depends on the circumstances of the new owners. Puppies that spend more time with us are socialized daily and adjust very well to a new situation when the time comes. I add information to the Puppy Packs continuously. It also depends on each litter as to what information will be helpful for you. I try to send home as much information as I can to get you started. Please feel free to email me with any questions, concerns or suggestions for the Puppy Pack that may help you. Please click on the links below to learn more about the food that we have fed for the last 10 years. We are very happy and pleased with them. Springtime Inc.-Wonderful source of All NATURAL Products....We use the GARLIC from Springtime. Click HERE for more Information on Springtime Garlic!! Y ou can order NuVet Plus through Breeder Referrals & Veterinarians only. They also have a product called NuVet Joint- an anti inflammatory hip & joint therapy!! It's great!! SPRINGTIME, INC.- we use and RECOMMEND the GARLIC from Springtime, Inc. for all your animals! Below is a page directly from their catalog! So many folks think that GARLIC IS TOXIC and it is NOT! NEED HELP with training...?? If you need help with something, please feel free to call or email me right away. We will try our best to find an answer..... We are dedicated to helping YOU and YOUR MINTERN PUPPY have a great life together! It's alot of patience sometimes but in the long run, it's an incredible experience!! Just Keep me posted on things! We can find a solution!! I am NEVER TOO BUSY to help either........PROMISE!! A great place for Great and HONEST help is LEERBURG KENNEL! Ed Frawley has experience we wish we all had!! Please check out his website for help on many issues, including Housetraining, Puppies Biting, Obedience work and many many other issues. Of course, everyone is entitled to their own opinion, so there may be things you or I do not agree with, but for the most part, it's a very helpful site. Great place to go for information on House Training is MIDWEST Homes for Pets. I send home a pamphlet from Midwest Homes that includes wonderful information. *PLEASE take some time to read about VACCINATIONS for your puppy. I feel very strongly about raising our pups and adults holistically and naturally....This website below has a lot of information regarding ANIMALS and PEOPLE! I hope that you enjoy it. A source for the NATURAL and HOLISTIC Approach!